In the period June to September 2014, fanSHEN collected stories about Tooting and the people who live and work there. We worked with and talked to a diverse range of groups and individuals from Tooting, ranging from Mushkil Aasaan to the South London Swimming Club, from Foodcycle to the Great Gustos, from the Tooting Community Garden to Sprout Arts, from Meet and Make to the Rhythm 'n' Babes toddlers music group. There are two different walks, each with their own map and soundtrack, which take walkers through familiar and less familiar parts of what we came to recognise as a very special part of London. Tootingwalks was launched at Transition Tooting’s Foodival on Sunday 14 September 2014; the audio walks are free to download at any time and you can do either of the walks whenever suits you. 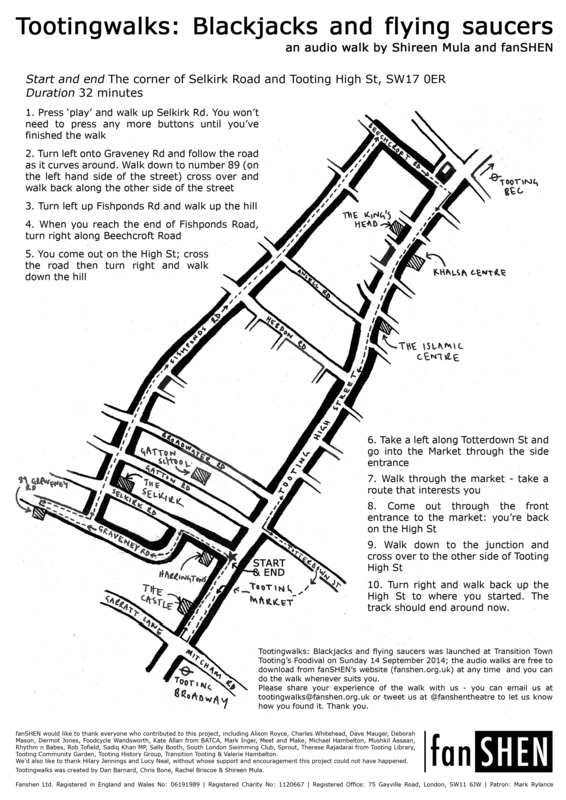 Walk 1, Blackjacks and Flying Saucers, starts and ends on the corner of Selkirk Road and Tooting High Street, SW17 0ER. It lasts 32 minutes. You can download a map here. Walk 2, Ordinary Transcending, starts outside Cafe Nero (opposite Tooting Broadway tube), 1 Mitcham Road, SW17 9PA and ends at Tooting Bec Lido, SW16 1RU. It lasts 40 minutes. You can download a map here. CREATED BY Dan Barnard, Chris Bone, Rachel Briscoe & Shireen Mula. fanSHEN would like to thank everyone who contributed to this project, including Alison Royce, Charles Whitehead, Dave Mauger, Deborah Mason, Dermot Jones, Foodcycle Wandsworth, the Great Gustos, Kate Allan from BATCA, Mark Inger, Meet and Make, Michael Hambelton, Mushkil Aasaan, Rhythm n Babes, Rob Tolfield, Sadiq Khan MP, Sally Booth, South London Swimming Club, Sprout, Therese Rajadarai from Tooting Library, Tooting Community Garden, Tooting History Group, Transition Tooting & Valerie Hambelton. We’d also like to thank Hilary Jennings and Lucy Neal, without whose support and encouragement this project could not have happened. Tootingwalks was created with support from Awards for All & Wandsworth Arts.